Imagism was the poetry of directness and distillation championed by Ezra Pound and Amy Lowell in the first years of the 20th century, reacting against the flowery verse of late Romanticism and urging poets to look to earlier models—like Sappho in ancient Greece and Li Po in 8th century China—to create a poetry of precise and powerful images, without any superfluous words or ornaments. Would James Joyce have ever made the Man Booker shortlist? Not, you guess, if the current crop of judges had anything to do with it. A Portrait of the Artist as a Young Man might have squeaked on, but Ulysses? Not a chance. “Readability” is the watchword of this year’s panel, apparently, led by the former spy mistress, Dame Stella Rimington. Fellow judge and ex-MP Chris Mullin likes something with a “bit of zip”. Given that the Booker is at heart a speed-reading contest for judges – 100-odd novels to read in a couple of months – it is not surprising that those poor unfortunates faced with the task favour books that can be tackled in a few swift hours. Eighty books in and counting, who would want to be confronted with Finnegans Wake? Poet/editor Ezra Pound’s contribution to what we now know as The Waste Land was profound and is well documented. Many years ago, British publishers Faber & Faber released a facsimile transcript showing his comments and crossings out and he is frequently referred to, rightly or wrongly, as the architect of the poem. Those amendments and alterations are included in the app and can be seen alongside the final version of the poem. There are hours of interest here in examining just what Pound left in and took out. Lewis Carroll, or rather the fictive world of Reverend Charles Lutwidge Dodgson, is firmly embedded in our culture. I am surprised no one has made a religion out of Alice. Perhaps they have. She is also very much at large in Tate Liverpool. Here she is, here she isn’t: in James Joyce’s Finnegans Wake and in Jorge Luis Borges; in Jefferson Airplane’s White Rabbit, and in the surrealist works of Max Ernst and Salvador Dalí. 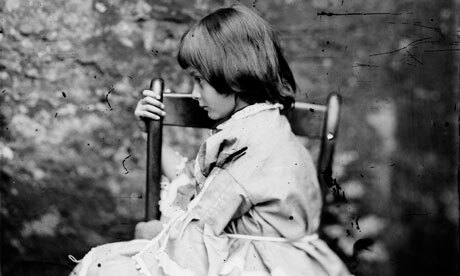 Alice captivated Virginia Woolf and Walt Disney, inspired Robert Smithson, Sigmar Polke and a host of better and worse visual artists. Characters from the Alice books, or rather their putative ancestors, can be found, according to Alberto Manguel (writing in a brilliant, short catalogue essay), in Hamlet and Don Quixote, in Kafka, Homer and the Bible. The influence of Carroll’s creation can be found in sci-fi, detective fiction and philosophy, in pre-Raphaelite painting and in hard-arsed conceptualism. You can’t shake Alice off. This entry was posted in Alice In Wonderland, Ezra Pound, finnegans wake, Hologramic Prose, imagism, James Joyce, Johnny Depp, Poetry. Bookmark the permalink.